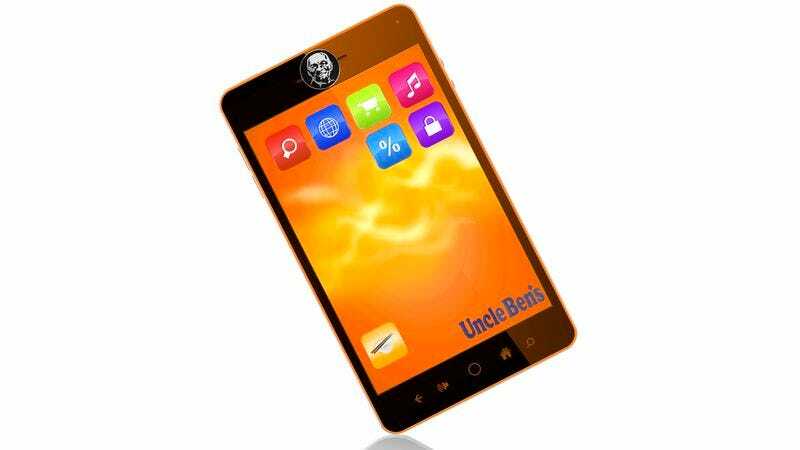 The new 4G Basmati phone from Uncle Ben’s. HOUSTON—Hoping to boost profits by cutting into the valuable market share currently occupied by Apple's popular iPhone 4S, top American rice manufacturer Uncle Ben’s announced plans Tuesday to release its first-ever smartphone. Uncle Ben's, a company traditionally known for producing white, whole-grain brown, and flavored rices, confirmed a Nov. 23 launch date for its new "Basmati" phone, a 4G-capable device expected to serve as the brand’s flagship product as the company makes its entry into the lucrative mobile technology sector. "Whether it's instant rice, country-style rice, boil-in-a-bag rice, or smartphones, Uncle Ben’s has always been committed to innovation," a statement from the company read in part. "In 1942, we introduced the world to easy-to-cook parboiled rice. Today, we wish to introduce you to a new vision, one in which people can cook up some Uncle Ben's on the stove and, at the same time, be on their Basmati browsing our marketplace for some new apps and texting their friends with our Instant Rice Messenger." "Our customer base is increasingly young, connected, and on the go," the statement continued, "and we're uniquely positioned to become the only company in America to simultaneously offer international phone service, Internet access, GPS, broccoli rice au gratin, and MP3 downloads of top recording artists." Traditionally, the Uncle Ben’s company has been best known for manufacturing rice. As first reported by TechCrunch and the USA Rice Council, the Basmati will feature a 5.3-inch display with a density of 285 pixels per inch, a dual-core 1.5 gigahertz processor, and two gigabytes of RAM, as well as a "robust set of entertainment features" that includes a rear-mounted 8-megapixel autofocus camera, dozens of preloaded stir-fry recipes, and Adobe Flash support. In addition, the Basmati will run on Uncle Ben’s proprietary Long-Grain Operating System, a platform designed to optimize graphics performance and speed using processes that, according to technical specifications released by the rice producer, "are entirely gluten-free." "We have the brand recognition," the president of the rice company added. "So let's capitalize on it with this smartphone." Many at the company expressed a like-minded confidence in the project, with one board member enthusiastically saying, “I think people are going to like an Uncle Ben’s phone even if they don’t like rice all that much.” Executives noted that their marketplace was rapidly changing, and whether they liked it or not, they would have to change with it. "Rice just isn't going to cut it anymore," said Tim Snyder, Uncle Ben's vice president of marketing. "If we don't get a smartphone on the market soon, we’ll have nothing to offer the millions of consumers out there who are eager to shell out hundreds of dollars for the latest high-tech gadget, but who—let's face it—aren't nearly that enthusiastic about rice." Reached for comment, experts in the rice and tech industries questioned the company’s strategy, noting that besides Apple and Google, Uncle Ben's will face stiff competition from Hamburger Helper, which unveiled its much-hyped "Helping Hand" smartphone earlier this year.